“It is fitting that after the Class of 2012 has presented a gift to Applewild and the Parent Association has made several gifts in support of our program and our future, that I introduce to you this year’s recipient of our Founders Award. The Founders Award recognizes loyal friends of Applewild whose service and stewardship have been particularly noteworthy. Mrs. Jamie Hoff certainly fits that profile. She served for 17 years on the Applewild Board of Trustees, including as Vice President on two different occasions, and served on many of the Board committees during her tenure, most notably Financial Aid and Development. For those of you students who do not understand what serving on a Board means, it defines the notion of “service.” You volunteer your time and, in Mrs. Hoff’s case, drive from New Hampshire to Fitchburg sometimes three times in a week even several years after your own children are no longer at the school, and you sometimes remain on campus for hours. We have come to emphasize civic-mindedness, service and being good stewards at Applewild in part because we have such shining examples in our midst as Mrs. Hoff. As Chair of the Development Committee for twelve years, Mrs. Hoff was responsible for providing essential guidance and training to our alumni and development effort. This effort includes our Annual Fund, capital campaigns, and planned giving initiatives – all of which encourage gifts to the school such as the ones we have received this morning. She proposed the Laverack Award as a way to recognize our alumni (and I am sure there will be nominees for Alumni Spotlight and Laverack Award from the Class of 2012) - and she initiated the Board of Visitors to help spread the word about the school’s excellence. She helped the school raise its sights in Annual Giving, increase percentages in participation, and accomplish the Campaign for Applewild that led to the construction of this building. “I am honored and deeply humbled to receive this award, and it prompts me to ask you a question: Did you ever wonder about how Applewild School came into existence? It wasn't here during the time of the Native American Indians, and it wasn't here during the American Revolution or the Civil War, or during the big World Wars. So, how did it get here, what happened? It was created as something entirely new because a group of people much like you thought it was a very good idea. The Crocker Family (who gave the land and buildings), and the Laverack Family (the first Headmaster's family), and the Founding Trustees brought this school into being based on their belief in a good idea. The Founders of Applewild School were people who wise and generous, certainly, but they also had something else very special, and that was IMAGINATION. Before there was ever a great school here on this hill in Fitchburg, the Founders first created it in their imaginations. They believed in a good idea, and then they did the hard work to bring it into reality. That's how Applewild came into existence over 50 years ago to be here for you today. Over the years, other families have been very important to Applewild and it is important to remember them along with the Founders. The Bullock family, Stone family, Ansin family, Marshall family, Williamson family are some names that you might recognize. The reason that I tell you that little story is because now I want to ask you to think with your own imagination. What are the good ideas that you believe in, that you can work hard to bring into the real world? You already have all the talent, and you have the ability needed, that's not the question. The question is: What is the good idea that interests you, what problem gets you thinking? Jarvis Hunt devoted 38 years of his professional career to Applewild School. He joined the school in 1958, just a year after Applewild opened its doors, and helped shape the school’s character from the very start. In addition to teaching science, he served as acting Headmaster, Assistant Headmaster, and Science Department Head. He directed the academic component of Applewild’s Summer School for many years. He was instrumental in the production of theProspector yearbook, and he took Applewild’s annual all-school Photograph. To colleagues and students alike, he was a mentor and respected friend. He inspired a generation of students with his enthusiasm for learning. Jarvis was educated at Phillips Exeter, Harvard University and Boston University where he received a graduate degree in Psychology. He worked in counseling before joining Applewild. He retired to Orleans, MA with his wife, Judy. He continues to teach science today to adult learners in various settings on Cape Cod. He is also the parent of alumni Jarvis “Jay” Hunt, III ‘75 and Christopher Hunt ’76. Jarvis has continued to support Applewild over the years, participating in various award ceremonies honoring his former colleagues, celebrating our 50th Anniversary at the Applewild Gala and “A Day at Old Applewild”, and serving as a member of our Board of Visitors. Applewild was very small in the early years, maybe 65 in 1958 when I came here, and a school that small is a very intimate place. Persis was so important in making the faculty, especially the new ones, feel welcome. I was as green as anyone could be – I had never been in a classroom except as a student, and it was very reassuring to know that "mother Persis" was always there when we needed moral support. FIRST CLASS is the one term that springs to mind when I think of Persis. As our dietician, she worked closely with Cynthia, the marvelous chef we had at that time. I hate to say this because things have changed so much in food expenses, but I can remember having swordfish and on occasion, steaks in the dining room! Another wonderful memory was the great faculty parties that Persis gave for us all. They were fun, delicious affairs that we all looked forward to. Persis, you were and will always be an integral part of Applewild School and, we are very pleased to present the Founders Award to you today. Honorary Trustee, Jeanne Crocker, and founding faculty member, Gus Stewart, were also on stage to present the award to Persis. Senior Faculty Master, Todd Goodwin, presented Persis with a Certificate of Appreciation on behalf of all faculty and staff. 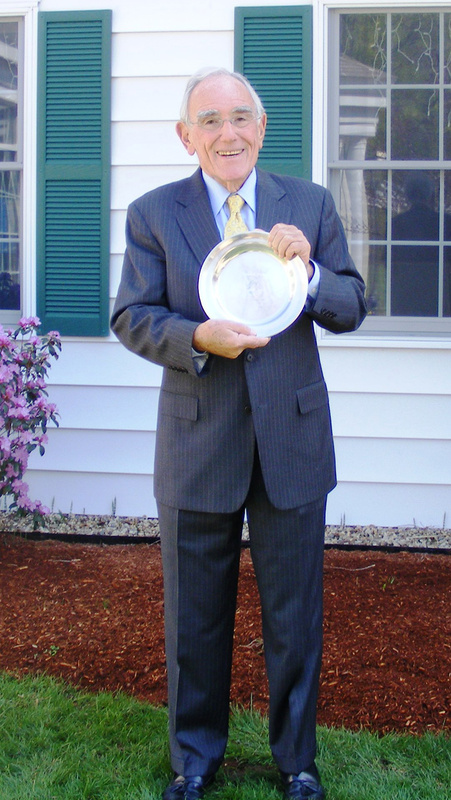 Ronald M. Ansin was honored as the fourth recipient of the Founders Award on Friday, April 25, 2008. The celebration was held in the AlumniCenter for Performing Arts with all students, faculty, staff, trustees, alumni, and friends and members of the Ansin family. Ron has truly exhibited the criteria for this prestigious award. He has served on the Board of Trustees for 30 years (1971 to 2001). He served as Treasurer from 1976 to 1983. He became an Honorary Trustee in 2002 and still serves in that capacity today. Chris Williamson welcomed the audience and Ron’s daughter, Kim Ansin Blanchard ‘77, began the tribute. She relayed the fact that it was Ron’s desire to have his grandchildren take part in the ceremony. Her sons’, Kurtis and Nicholas Bryars, delivered a delightful and humorous tribute to their grandfather. Kristopher Ansin and Ryan Ansin, who were unable to attend the ceremony in person due to scheduling conflicts, arranged for Kim to read their tributes to their grandfather on their behalf. Clarence Rabideau presented Ron with a Certificate of Appreciation on behalf of all current and former faculty and staff. David Stone ’73, President of the Board, formally presented the Founders Award to Ron. “I’d like to thank Kelly Jennison for all of the work that she put into making this such a special day for my Dad. Thanks also to Anne Davenport and Sean Morrow of the Development Office, and to David Stone and Chris Williamson for their efforts as well. I know that we all feel that my Dad has given a great deal to Applewild. Thank you all for making this, his day, so special. My Dad is one of the proudest grandfathers I know. He just beams when he talks about his grandchildren. So it was no great surprise that, when he learned that he had been chosen as the fourth recipient of the Founders Award, he said that he would love to have his grandchildren speak in his honor. Well, I thought that was a great idea! It meant that I wouldn’t have to write a speech and get up in front of a whole lot of people and speak! We would pass the torch to a new generation! (Kurt) “Grandpa, it’s cool that you are getting the Founders Award because you definitely deserve it. I mean, my Mom has been a trustee for two years now. You’ve been one for thirty years! My Mom’s been to an unbelievable number of meetings at Applewild in just two years. How many have you been to in thirty years? Now, you were my first math teacher. Let’s see how you, Mrs. Gregson and all my other math teachers have done…. Let’s see if I can get the math here right! My Mom has about four Applewild meetings a week, I think. So four meetings a week times the thirty-two weeks we are in school means that as a trustee she goes to about 128 Applewild meetings per year. So she has been to about 256 meetings and that seems like a ton to me, Nick and Scott! But you! You have been to thirty years worth of Applewild meetings! That is about 3,840 meetings just for Applewild! WOW! That’s a lot! (Nick) 3,840 meetings Grandpa. That is a lot of sitting! It’s probably a lot of reading too, because we see the paperwork our Mom has to go through before each meeting. I sure hope that at least some of your meetings were DINNER MEETINGS! Maybe even buffet dinner meetings because we know how much you enjoy a good buffet! Seriously Grandpa. I know that you have devoted your time and energy to Applewild because you love the school. You have helped literally hundreds of kids by making Applewild what it is for all of us today. I also know that you do a lot of things sort of under the radar, anonymously. So I am guessing that there are even more ways that you have helped Applewild, on top of all those meetings, that I don’t even know about. You are a great role model and teacher. You make things that seem confusing and hard to understand seem so simple. You think about things and can explain them so that anyone can understand and feel smart and confident. Just like you have helped me through the hard math problems, I am sure you have helped lead Applewild through all sorts of things in the more than thirty years you have been volunteering here. Eight years ago, we gathered here to recognize Grandpa's contributions to Applewild. Unable to attend because of a back injury, Grandpa's address to the audience was limited to a video monitor. Today, as I am unable to be with all of you, I thought it best to pass on a few words should the video crew not reach me in time. “I am extremely proud to say that had I been able to be here today, this would not have been my first time standing in front of an Applewild audience, and congratulating my Grandfather, Ron Ansin. Many of us have thanked my Grandfather before, many times over and with good reason. He deserves it. This is quite a man you have on your side. His job, which he does flawlessly, is essentially to care. Sounds simple. And he would tell you that it is because he believes in the mission, as well as the past, present and future success of Applewild. However, to care about something to the extent that he does and to invest a good chunk of his lifetime with that is unique. Grandpa’s realm of caring for this school expands far beyond our basic understanding of the matter. Everybody has a hobby that they adore to the point where they can talk about it to no end. I’m not saying Grandpa does not have any hobbies by any means, I’m just trying to convey the intensity level of Grandpa’s love for Applewild. All of you with children can discuss his, her or their best qualities for hours to anyone in the world because they are such important parts of your lives. This is essentially what I’ve observed in Grandpa’s feelings towards this establishment. Look at how much he has invested here. I don’t mean financially, or even his time he has spent mentally, and physically, but his investment in trust. As of today, eight of his dearest family members, (maybe I’m flattering myself, at least seven dearest and me) have walked through these halls, marked up the majority of his or her desk and eventually succeeded. The level of trust it takes to send four children and four grandchildren, so far, to any entity, person or school, is staggering. If Grandpa could home school us all in a healthy way, he probably would have. And aside from potential childhood obesity from keeping up with his nutritional intake, we would have left Ron Ansin’s own elementary and middle school very intelligent. I can prove this as I still remember the math, grammar, and historical facts he has imparted on me just in passing. Other than taking our education in his own hands on a daily basis, a close second option in the eyes of my Grandfather’s eyes is to spend time here. I did. I spent a lot of time. Perhaps a few hours per week more than the average student thanks to my demerit-acquiring nature back then. Everyone from Quail to Corbey to Chamas tried to squeeze it out of me, and who could blame them? They knew how amazing a person my Grandfather was and is. So why couldn’t I morph into him, but younger? He was always very well mannered on Grandparents Day! To alleviate the worries of all those teachers who must have turned to ibuprofen or stronger, due to my headaches, I’ll tell you: I agree. I would love to grow up and emulate Grandpa. I can’t think of someone who is more giving of all his resources than he. We, as a family, are proud. And he deserves to know that. This is why this particular award stands out. We are all invested in it. We have all directly experienced the fruit of his labor. By we, now, I mean everyone here. We are students, alumni, faculty members, staff and family members whose lives have been touched by Applewild. Grandpa, everything you’ve done here, though you reap partial benefit because we all come out better than when we went in, has been for others near and far. You did it for all of us, for our brighter future. Please gloat today. Tomorrow you can return to modesty. 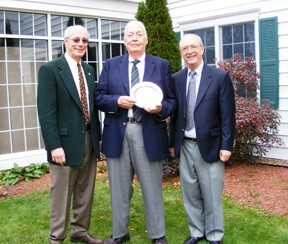 Albert Stone was honored as the third recipeint of the Founders Award on Friday, April 27, 2007. 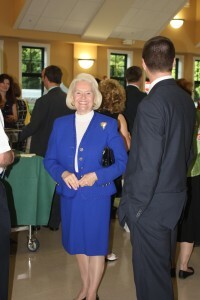 The celebration was held in the Alumni Center for Performing Arts with all students, faculty and staff, and also trustees, and members of the Stone family. School Head Chris Williamson opened the ceremony by acknowledging the community service our current students participate and the recent Parent Independent School Network (PIN) Community Service Award that Applewild received for this commitment to service. Bill Marshall, long time Head of Applewild School, delivered remarks about Al's association with Applewild, as a parent, Board President, trustee and honary trustee. Bill's remarks included singing a couple of lines from a song! Clarence Rabideau presented Al with a Certificate of Appreciation on behalf of all current and former faculty and staff. Jamie Hoff, Chair of the Development Committee, formally presented the Founders Award to Al. Al accepted his award by telling the students a story from the book called Three Questions. He concluded, "As you ponder the meaning of this story to you, think about your teachers at Applewild who every day spend their best time with you, helping you to learn. Think of the ways you can spend important time with those persons near you and how you can help them. And you too will find your own answers to Nikolai's three questions." Honorary Trustee service began 1983-84 school year and is still currently serving in that capacity. · She was an active member on the Finance Committee for many years. · She has instilled great values and perspective in our Applewild community. · She believes in equality and has been a prime advocate for more diversity at Applewild. · She is genuinely respected for her leadership and service by all who served with her. · Genuine love and interest in Applewild today! Jeanne has been a loyal and faithful volunteer to Applewild for over 42 years. Her commitment, guidance, and leadership have been a true gift to Applewild. We are sad to announce that Mrs. Nancy Bullock passed away on June 6, 2005, the day before she was to receive the Founders Award. It was a bittersweet moment in Applewild's history. 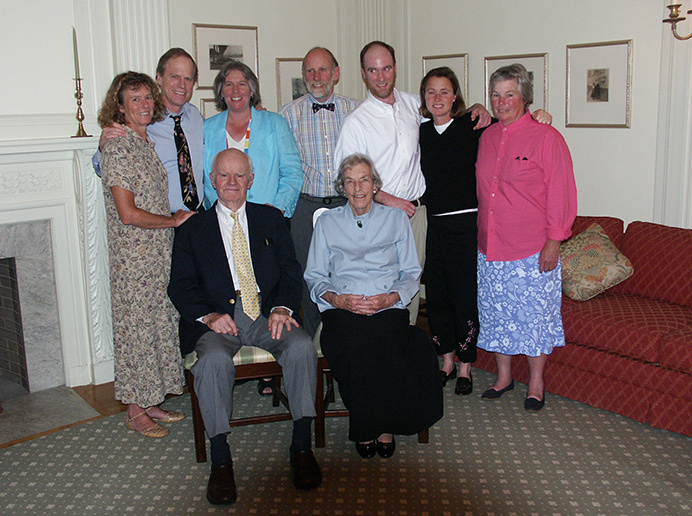 Her daughter, Nancy "Bunny" Bullock attended the ceremony on June 7, 2005 to receive the Founders Award in her mother's honor. Bunny gave a heartwarming tribute that spoke of her mother's loyalty to Applewild. Bunny relayed to the audience that the morning her mother passed away she spoke of the ceremony at Applewild. Mrs. Bullock insisted that Bunny attend the ceremony in person to receive the award on her behalf. What a remarkable tribute to Mrs. Bullock's love and concern for Applewild School. Mrs. Bullock was the only surviving member of the Applewild School Founding Trustees. 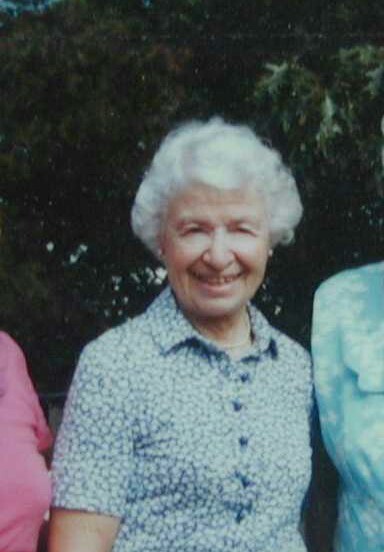 She served as a trustee for fifteen years beginning in 1956, prior to the opening of Applewild School, through 1971. She grew up in Townsend and attended Townsend Public Schools. She later attended theNetherwoodSchool in New Brunswick, Canada. She continued her education at the Columbia Presbyterian Hospital School of Nursing in New York City, graduating in 1936. Mrs. Bullock worked as a registered nurse in Hamilton, Bermuda. She later worked in the pediatric unit at BurbankHospital in Fitchburg. She married Richard Bullock in 1940 at Christ Episcopal Church in Fitchburg. They lived in Fitchburg and spent summers in Princeton. Mrs. Bullock was a founding trustee of ApplewildSchool in Fitchburg and served on its board of directors. She was the last living founder. Mrs. Bullock was active in Christ Episcopal Church, where she was a member of the Vestry and the Altar Guild. She was also a longtime member of the Society for the Companions of the Holy Cross in Byfield.Mrs. Bullock was a volunteer with the Burbank Hospital Guild. Mrs. Bullock was also a good neighbor and friend of Applewild. For many years she had given tours of her historic home on Prospect Street to Applewild students.